Manuel Pellegrini claimed Marko Arnautovic “has his head on another issue” after the player was left out of West Ham’s squad for the 2-0 defeat at Bournemouth. Austria international Arnautovic, the club’s joint leading scorer with eight goals, is keen on a big-money move to China, with Shanghai SIPG having already had a £35million offer rejected. Hammers boss Pellegrini said on Thursday that the 29-year-old would be allowed to depart, subject to a “good deal for both parties” being agreed. Second-half goals from Callum Wilson and Joshua King condemned the Hammers to defeat at the Vitality Stadium after Arnautovic’s replacement, Andy Carroll, squandered a golden chance with the game goalless. “The reason is because as a manager you must choose the players that work better during the week,” said Pellegrini, explaining his team selection. “Marko has his head on another issue so I thought it was not a good idea for him to play today. “I don’t think we need to continue talking about players that are not in the squad in this moment. “I never complain about players who are not here. Spanish striker Lucas Perez was also left out the Hammers’ 18-man squad. Arnautovic waved to home fans when he was substituted during last weekend’s win over Arsenal. His absence was the major talking point ahead of Saturday’s south-coast clash and resulted in the Hammers’ only change, with Carroll given just a second league start of the season. He failed to take the opportunity, blazing his side’s best chance over the crossbar from a couple of yards with the goal gaping after Michail Antonio made a mess of the initial effort. “When we started the second half, we had a clear option to score the first goal, maybe that will change the game, absolutely,” said Pellegrini of Carroll’s effort. 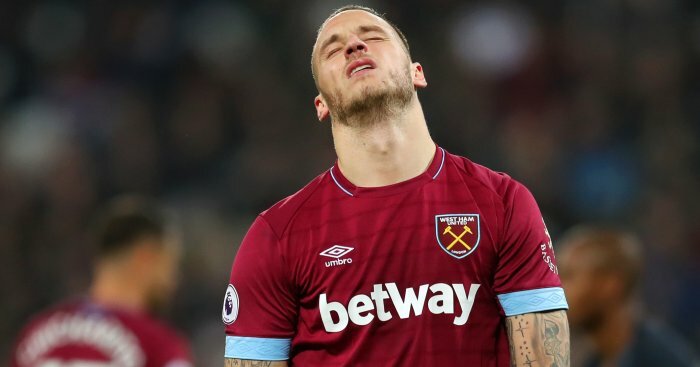 The post West Ham star nearing £35m departure as Pellegrini explains absence appeared first on teamtalk.com.